Sea Breeze Cintsa East - Cintsa (Chintsa) Accommodation. 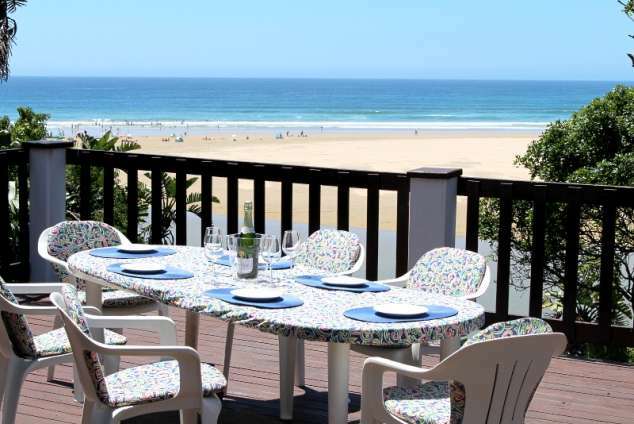 In tune with nature – self-catering ocean apartment - direct beach access. A place with space surrounded by natural vegetation where you can soak up the sun in peace and privacy, enjoy the abundant bird life and tune in to the rhythm of the gently pounding surf. For the energetic the lagoon and beach are well suited to a variety of water sports, while the rocks offer good angling spots, or simply chill on the deck and build castles in the air. Bedroom 2 with sliding doors to garden, sea views, King bed (adjoining bathroom with bath, basin and toilet). Large games/family room with table tennis, table and chairs and board games for rainy days. Hob & under counter oven. Off road parking for 2 vehicles. All crockery, cutlery, bed linen, bath and beach towels. Initial supply of toilet paper, soap, tea, coffee, milk. Full DSTV Bouquet. Free Wifi. DVD player. Security 24 hour response and outdoor beams. "Our family stayed for 5 nights and had a really wonderful, relaxing time, enjoying the sea and exceptional beach walks. The accommodation was excellent, with everything we needed and more! We highly recommend Sea Breeze for a peaceful break. Thanks to the kind and friendly hosts for making our stay more memorable." 885 page views since 17 Sep, 2018.